This pomegranate margarita recipe is a seasonal twist on the traditional margarita. In-season citrus fruits + rosemary simple syrup add delicious holiday cheer! 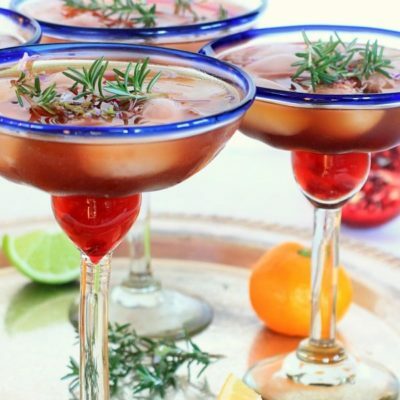 I can’t think of any better way to say Happy Holidays to all of you, my wonderful Spicy RD friends, than with a holiday cocktail party, So Cal style, complete with delicious, healthy holiday appetizers + a Triple Citrus Rosemary Pomegranate Rosemary Margarita. 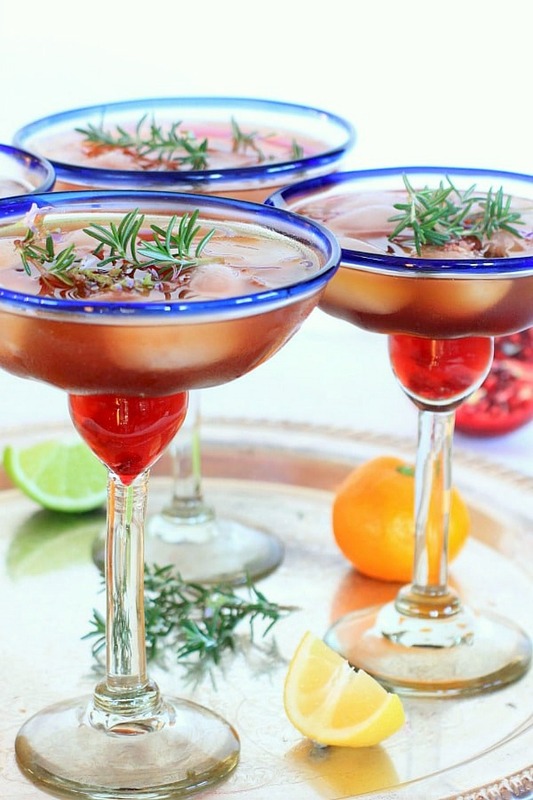 Of course you’ll need something fabulous to sip while you nibble on all these yummy appetizers…like a Triple Citrus Rosemary Pomegranate Margarita! Inspired by the fragrant and delicious citrus fruits ripening in Southern California this winter, gorgeous red ripe pomegranates, and copious amount of rosemary growing in my garden, I created this festive, and, dare I say, healthy, Triple Citrus Rosemary Pomegranate Margarita. If you’re not imbibing, this would be equally delicious with sparkling water in place of the tequila. Cheers! This pomegranate margarita is a seasonal twist on the traditional margarita. In-season citrus fruits + rosemary simple syrup add delicious holiday cheer! Combine water, sugar, and fresh rosemary in a pan and heat on high until boiling. Remove pan from heat, cover, and let rosemary steep for 30 minutes. Strain liquid, and store in a jar in the refrigerator, until ready to use. Combine tequila, juices from tangerines, lemons, and limes, and rosemary simple syrup in a cocktail shaker or jar with ice, and shake until well combined. Place ice in 4 margarita glasses, and divide shaken margarita mixture equally between the 4 glasses, then top off each glass with ~ 1/4 cup pomegranate juice, or until glass is full. Garnish with pomegranate arils and a sprig of fresh rosemary. Make a Mocktail! Swap tequila with sparkling water. 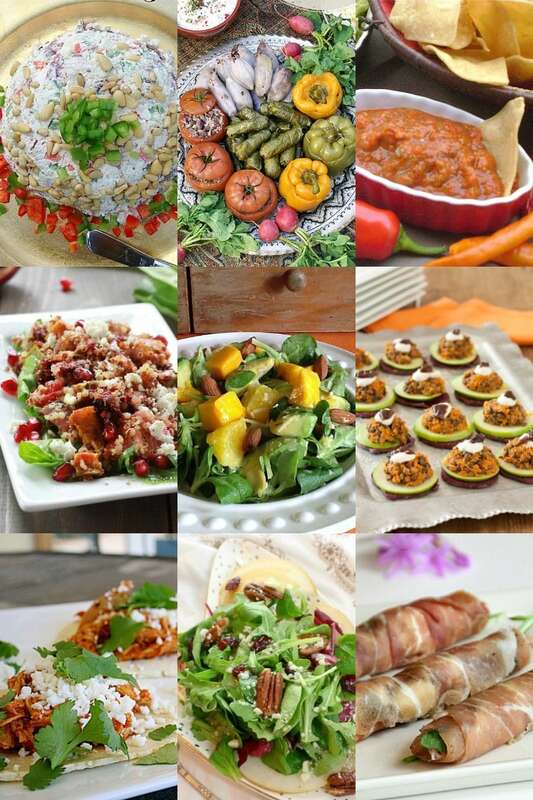 What’s your favorite holiday appetizer to bring to a party? Are you a margarita lover? What’s the best margarita you’ve ever had, and where did you drink it? If you enjoyed this post, I’d LOVE for you to share it with your family and friend. Thanks so much for your support in helping me spread the word that healthy IS delicious! Such a great collection of recipes – and what a beautiful drink! I’m in! Cheers! This really is a wonderful collection of recipes! I’ll share on my FB page…and pin….etc. Thanks so much Dorothy! Your goat cheese w/ figs and arugula looks amazing 🙂 Happy Holidays! I love the blog because I love finding new recipes and I appreciate the food photography! Yum! One of these days we will make the long, what 10 minute drive, to see each other in person and toast with this delicious margarita!!! Happy Holidays! The margarita sounds delicious! Great giveaway! So happy to have you here Teresa, and thank you so much for your kind words-MUCH appreciated! Looking forward to sharing more healthy and delicious recipes with you too 🙂 Happy holidays!!! Come on up to the ranch and we’ll make up a batch of your margaritas! We have tangerines, lemons, limes…and a pomegranate tree too! Rosemary in the garden…yup, we might need to have a party. Beautiful post! Just saw your post on FB and it’s funny because I was JUST thinking about what to make for a holiday drink this Christmas!! Yeah, I’m daydreaming today. This sounds wonderful. LOL..I’m daydreaming everyday 🙂 Happy to inspire your Christmas drink choice Gina-hope you love it as much as I do! OK-I am SO curious….is a 7 Fish Dinner, really a dinner w/ 7 types of fish??? We go out for Christmas Eve dinner to a small French restaurant that is beautifully decorated and the owner plays the tambourine-so fun-then Christmas Dinner at our house. I love this time of year too 🙂 Cheers! The margarita’s sound delicious! I love something cold when it’s cold outside! 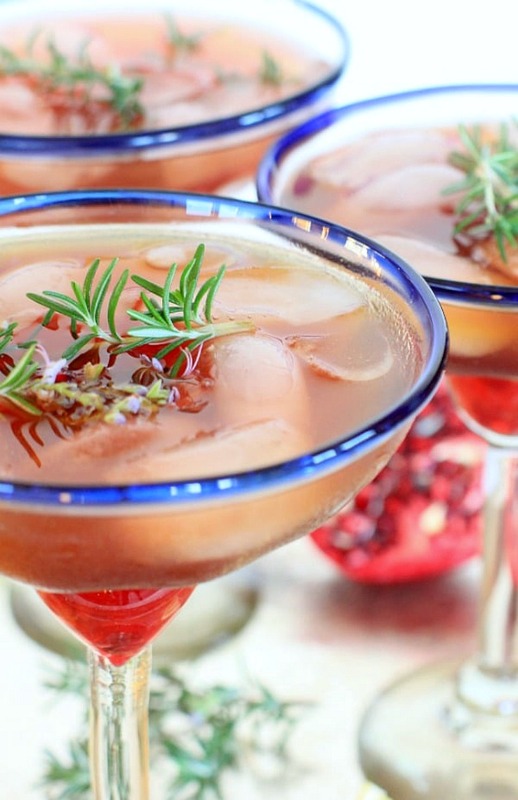 Love all the juiciness in this holiday inspired margarita EA! Wishing you well this Holiday season! Thanks so much Jeanette! Tangerines are one of my favorite holiday fruits and combined with lemons and limes, they make for a perfect margarita 🙂 I hope you have a wonderful holiday season as well! You are amazzzing!! I’m a margarita girl at heart, and love the tartness of lemon and lime. And now you’ve added my beloved pomegranate too?? I think I’d like to be your new BFF!! Cheer to you this holiday season, I’m totally in for this cocktail party. Gorgeous photos!